I think I've found the size of fabric baskets that will work for me (right now). I cut each of the sides 19" x 11" and boxed in the corners so the baskets end up being 6" wide. The finished baskets measure 12" x 6" x 7" tall. They are perfect for all my scraps. I put my leftover little scraps in one, medium size scraps in another, and everything else that is too small to fold up in the third one. For me, I never really know how something will work until I actually use it so I'm not 100% sure that my scraps will stay in these. I do love the fabric. It's a twill-weight, just a bit lighter than canvas that I bought a few years back at Ikea. I used Pellon 809 Decor Bond interfacing fused to the lining. They stand up nicely and look great with the gray/black/white color scheme of my sewing room. This was one of two items that showed up on my doorstep Friday afternoon. My husband has been dreaming of buying one of these for a very long time. Like more than a year. So last week he finally pulled the trigger and ordered it from Makita. I honestly don't know what it is. I guess it's some sort of saw. All I do know is that he says it will make it much easier for him to build me things. 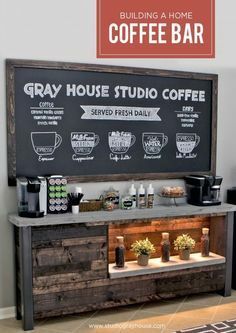 In fact, today he is starting on the coffee station I've been wanting since last summer when I painted my kitchen. So even though I don't really know what makes it different than the table saw and the band saw and the scroll saw and the chop saw and the radial arm saw he has in the basement, I am very happy that he is happy. I have 4 quilts entered in the Winter Quilt Show in West Bend, WI. I've never entered quilts in a show before. I was very surprised to see all 4 of my entries on display. My husband was so proud of me that he had to snap photos of me in front of each and every one of the quilts. I'm posting the photo (of me) that I like the best. 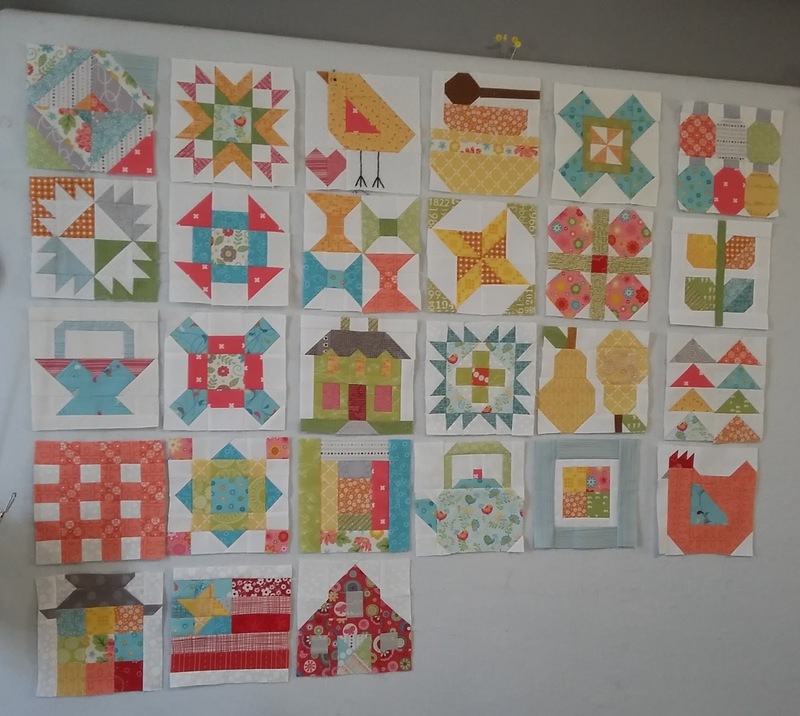 Besides my 4 quilts, my modern quilt club entered our group project called "The Quilt that Made Milwaukee Famous". We all decided to make a quilt block that represents a Milwaukee landmark. We had a few rules. We had to all use the same color palette and our blocks had to measure at a finished size in increments of 8 inches. My block is 8" by 16". After the block were completed we spent a Saturday morning laying the blocks out. It was a great group project. We had one of our members sew the sashing around the blocks right on the spot. There was going to be no guessing after the layout was agreed upon, we were completing the top that same Saturday morning...well early afternoon by the time we were done. The quilt was sent out to be quilted and then completed by another member of the group. It sure turned out great. Of course, the day would not be complete without a little shopping. Me and my friend Sue enjoyed stopping at every vendor booth and perusing all the wonderful fabric selections. We were both on a mission to find specific things and Sue found what she was looking for but I did not. That did not stop me from shopping anyway! I love fat quarters so I added many to my stash at great prices. I can't wait to start another project. I just finished block #10 in the 182-day winter solstice mystery quilt challenge. I purposely skipped blocks 8 and 9. Block 8 is a heart-in-a-heart-in-a-heart applique thing that I just do not like. I thought I would make it anyway, but I just cannot bring myself to do it. Block 9 is this huge thing that has lots of half-square triangles. I tried to make it. I cut the pieces and made the half-square triangles and put the pieces on the design board. Just did not like that one either. At least I tried to make it. It was a reminder as to how much I really hate mystery quilt projects. Maybe I will revisit these blocks after my disappointment fades. I am using a pretty fabric bundle where all the fabrics are well coordinated, but this is still not tickling my fancy. I have to stop with the mystery thing - that's all that's to it. I usually need to plan things out from beginning to end before committing to a quilt top - it's just who I am. I knew better from past experience but I talked myself into trying again. I hate to sound so negative, but I'm not afraid to admit when something doesn't turn out as I wish. I see a charity quilt - so all is not lost. My newest sewing machine comes with many stitches. So many that they are grouped into modes. Six modes, in fact. There are little images next to each stitch setting that gives a nice visual of how the stitch will look. Somehow that's not enough for me. There's just not enough in that little picture to help me see what the stitch will look like when I use it. Today I decided to take a scrap quilt sandwich to test out some of the stitches in mode #2. By stitching an entire row I got a better idea of what the stitch setting looks like. I did not adjust any of the default stitch widths or lengths so that I had the baseline view of the stitches. I chose my favorite stitches and sewed a long row then wrote the stitch number next to the row. 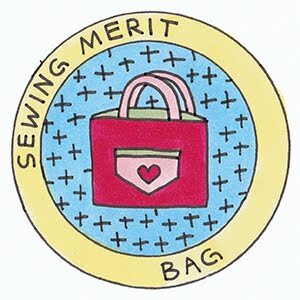 It was a lot of fun and I think this will be a handy little thing to have the next time I want to add a little embellishment to a project. My kitty loves the vibration of my machine and he spends lots of time sitting on my sewing table. Today he is especially needy. He just had to sit between me and my machine. He really didn't get in the way, he just stayed still and watched my hands move while he purred. He is such a delight. Happiness is a Valentine's Day cupcake to share with my honey. 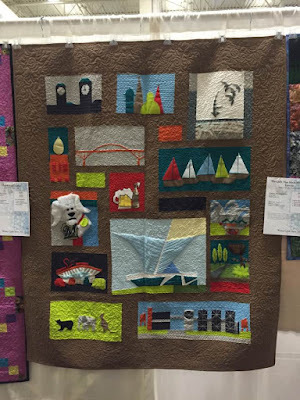 The Winter Quilt Show in West Bend, Wisconsin is one of my favorite quilt shows. It doesn't hurt that it always falls on the weekend right before my birthday. My husband comes with me to the show and he enjoys buying me my birthday present from one of the vendors at the show. It's a win-win for both of us; he gives me a gift he knows I will definitely enjoy and appreciate while making the decision of what to get very easy. This year I decided to enter some of my quilts in the show. I've never done that before. 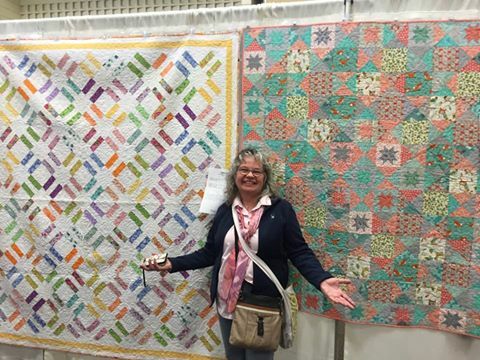 I chose to enter 4 quilts in the show; my selvage quilt, my shoo-fly, modern battlefield, and pick-it fences quilts. I can't believe I took the plunge and actually entered a contest. I'm not all that confident with my work. 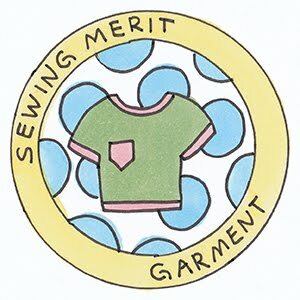 I wrote up the paperwork necessary to enter them, added the proper quilt labels required by the show's committee and off we went today to the drop-off point. I have no expectations as to how this will turn out but I am already glad I took that first step. 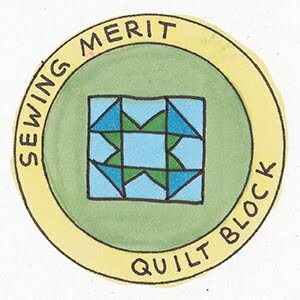 Maybe this year, instead of my husband getting me a birthday present, I will get some more self confidence in my quilting...what a gift that would be! 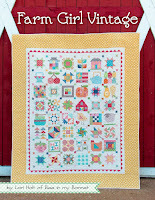 I love entering contests and giveaways provided by online quilters and quilt shops. I've been very very lucky. 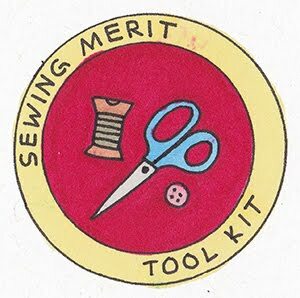 I've won fabric bundles, thread packs, patterns and even quilting tools. On December 29th I entered a giveaway from Bungalow Quilting and Yarn's Instagram account. 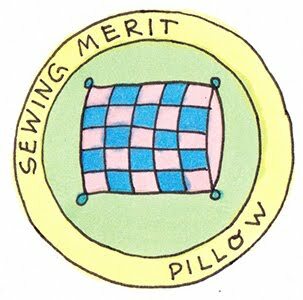 Sadly, I don't go on Instagram as often as I should, especially since there's plenty of quilting inspiration there. Not to mention giveaways. Last week I went on my Instagram account only to find out I won that giveaway from back in December. I immediately contacted Judy over at Bungalow Quilting and Yarn to give her my address. The prize was $90 worth of fabric called Adventures by Amy Ellis for Moda. The gift included a jelly roll, charm pack and layer cake of the same collection. The fabric is fabulous and I am thrilled. I hate to sound ungrateful but I have won a few batik fabric bundles in the past and I am really not a fan of batiks. So I shared those fabrics with my girlfriend who was thrilled. So I did pay those forward. But this fabric collection is right up my alley! Thank you so very much, Judy for your generous giveaway. 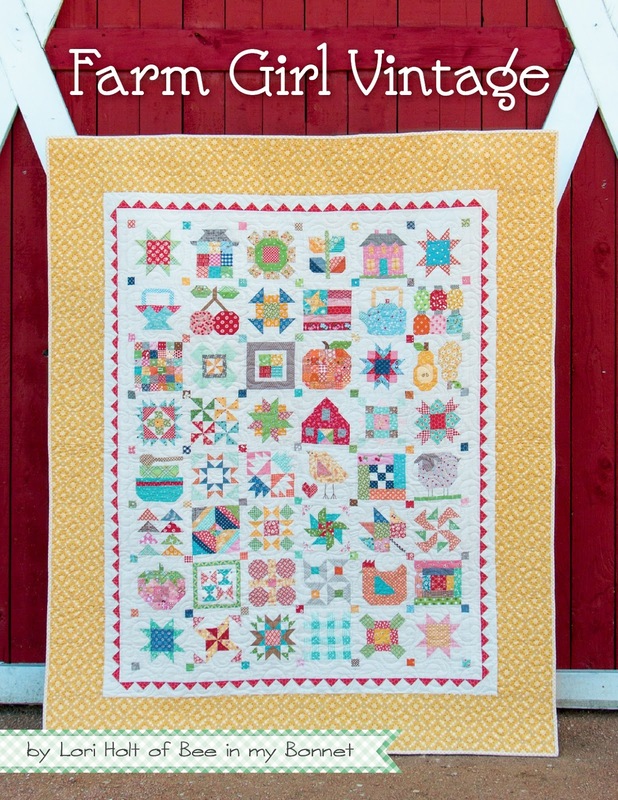 I started my Farm Girl Vintage quilt last week. I struggled with starting this project because of fabric selection. I just could not commit to a color plan. So I started just picking up scraps that I didn't care about and making blocks. It was horrible. I was so disappointed. Out of the blue, I picked up a fat quarter that I just loved. It was part of a collection that I purchased over the course of the summer. Before I knew it, the color selections were getting easier and easier. And I had scraps that I could add in as well that I really liked. So I started over. I am working through the book from the beginning. I'm making each block in order and working through my stash and scrap basket to make the blocks. They are so very fun. So far I've found this project as a great learning experience. First of all, I learned that I should always work with colors I love. That makes fabric selection easy. Secondly, I should try new things more often. In making these blocks I've tried new techniques and really enjoyed the process. I have to do that more often. I am 27 blocks into the project and I am still learning new things. The last block I made, I don't like. I realized that even though I love the fabric, it's way too busy for the barn block. I will make another one and replace that one. I can't wait to turn to the next page in the book to see what I will get to try next. I found the perfect basket for my current scrappy needs! I used the Quick and Easy Fabric Basket tutorial from the Simple as That blog. The tutorial can be found here. The baskets are large. They finish at 14" x 6" and they are 7" tall. At first I thought I wanted smaller baskets; one in each primary color to throw my scraps of that same color inside. After I made one red/pink basket, I realized I did not want to dedicate the amount of time necessary to make at least 6 of those things. That doesn't mean I won't make one in each color eventually, just not all at once. So I dug some cute twill fabric left over from a bean bag chair I made for my granddaughters. I decided that this would be good fabric to use in my basket experiment thinking that if I didn't like the finished project, I could pass it on to my granddaughters for their stuffed animals. But alas...they turned out to be just the right size! Instead of using scrap batting to line the baskets, I used Pellon 809 craft fuse decor bond interfacing. It is very stiff and makes a nice interior that stands up to the twill. I was happy that I had enough fabric to make 2 matching baskets. The only change I made from the original instructions is instead of cutting 2 interior/exterior pieces 11" x 22", I cut 1 piece 21" x 22". So there was no bottom seam. Since I had such large pieces of fabric to work with, it seemed silly to cut them in half. So I saved myself the effort of the extra seam. I chose to use some of the decorative stitches on my machine to embellish the basket handles and the upper edge of the baskets. It was a lot of fun using the stitches and I will have to do more of that with future projects. Like maybe use some different weigh threads. All my scraps worth keeping fit nicely in one basket and all the bigger project leftover pieces fit great in the other. I really really like the baskets. However, I do think I will make some more out of different fabrics...these would look cuter in my granddaughters' bedroom than in my sewing room. I followed the Fussy Foldover Basket tutorial from Mon Petit Lyons' blog. The baskets looked cute and I thought they might be the right size to hold my scraps. My plan is to find the right size basket then make a bunch of them in different colors. Each basket will hold the scraps that pertain to the color of said basket. I changed a few things from the tutorial. I pieced the fabric for the outside of the basket instead of using 1 piece of fabric. I made the the pieces 12" x 10" instead of 10" square. Instead of using fusible fleece, I chose to use leftover batting and I quilted the batting to the outside pieces of the basket. The original basket also has a pocket on the outside and I chose to exclude it. Once finished, I pulled all my pinks and reds from my scrap basket. I loaded them into their new home. I thought this basket would be the perfect size but it turns out that all my scraps don't quite fit. The basket finished 7" x 6" wide and 7" tall. When the basket rim is folded over, it's 6" tall. It is definitely a nice size, but too small for my plan. I had to leave out the bigger scraps, they just didn't fit. I really liked making this basket and I will probably make more, just not for holding my scraps. The original tutorial can be found here. This month I am starting fresh. I'm not sure how thing will go, there are many family birthdays that are celebrated this month so I'm not really sure about my sewing time. I think I will have to be very diligent in order to accomplish things. I thought I would try something new so I got out my Farm Girl Vintage book and my scrap basket. 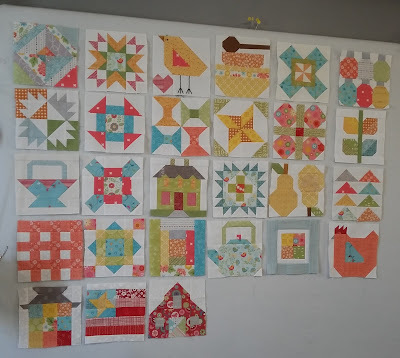 I made a few sample blocks in order to plan out a color way for a sampler quilt. The blocks on my design board are the results of that process. I really don't know which block I like best. Do I use up some bright colors or do I go with the vintage softer colors? I am just not sure where this project is going. Maybe I should put away my scrap basket and start with new fabrics because I am not thrilled with any of these blocks. I do love auditioning things on my design board though and I love looking back at my progress over the months. I feel very lucky today.